If you like social media data and science like this, my latest book “Zarrella’s Hierarchy of Contagiousness” is now only $1.99 in Kindle Edition (which will work on any computer or device). Buy it now! One of the questions that I’ve been asked the most in the years I’ve been doing Twitter data analysis is where in a Tweet is the best position (beginning, middle or end) to include a link to get the most clicks. I had always assumed the end was the best, so I never thought much about the question. But about a month ago, I decided to actually look at the data about it and test my assumption. Over the course of the next few weeks I gathered 200,000, random, bit.ly-link-containing Tweets. I used the bit.ly API to calculate a click through rate (clicks on a link divided by number of followers of tweeter). And then I analyzed the relationship of the link’s position inside the Tweet and it’s CTR. I figured the best way to visualize this would be through a heat map. The entire heat map symbolizes a Tweet, with areas to the left in the beginning of the Tweet and areas to the right at the end. Dark red bars represent a position with a high CTR and light-red or white bars show a position with a very low CTR. 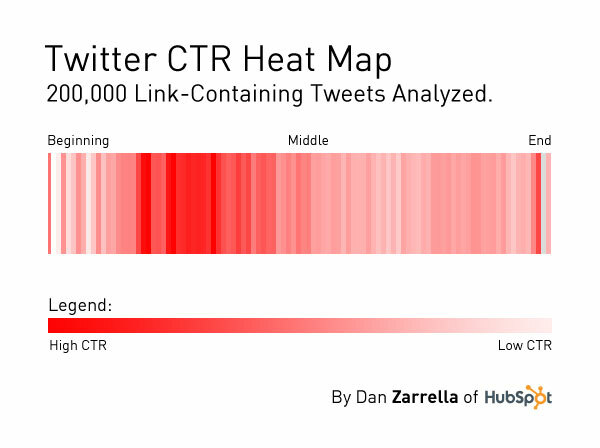 It turns out that the best area for clicks is about 25% of the way through the Tweet. Do these findings match your experience? Will you be experimenting with this placement?